If you were driving across the beautiful southern Colorado landscape near Pueblo, you probably wouldn't even notice them: almost one thousand concrete storage "igloos" burrowed into the landscape. 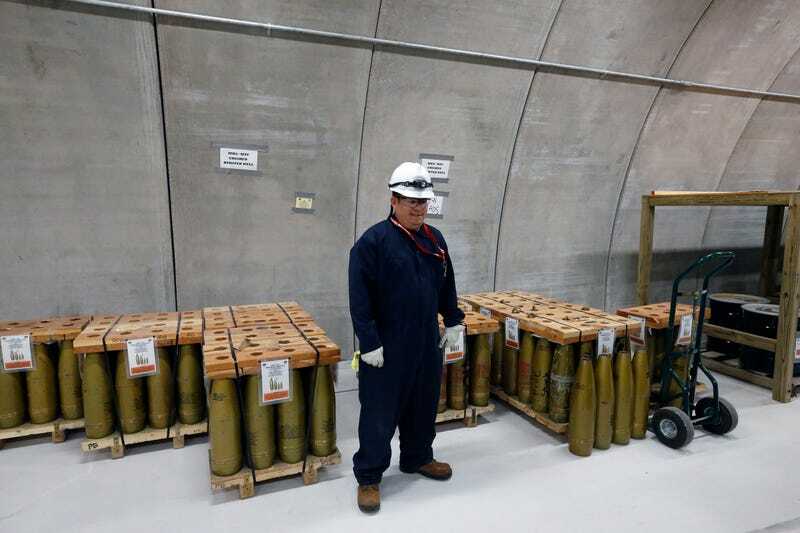 This 23,000-acre complex has stored the remaining biggest cache of chemical weapons in the US since World War II. Now, it's the site of a huge operation to destroy them. It's a supremely dangerous job, and it's been the subject of years of planning and training. The US government is in the process of finishing the Pueblo Chemical Agent-Destruction Pilot Plant, a $4.5 billion dedicated factory inside the storage complex, where the hundreds of thousands of mustard agent shells will be destroyed, neutralized with hot water and then "digested" by bacteria that can break it down into more manageable (but still hazardous) waste, as the AP reports today. The problem is that in the meantime, some of the nearly one million shells stored here are getting old—and leaky. These defective shells will need to be specially treated instead, using what the Army calls its "Explosive Destruction System." Here, the shells are actually detonated inside a hulking cylindrical chamber made of nine-inch-thick steel. "The blast, vapor and fragments from this process are all contained within a heavy, sealed stainless steel vessel," the plant explains on its website. "Before the vessel is reopened, destruction of the chemical agent is confirmed by laboratory sampling of residual liquid and air from the interior of the vessel." Though the chamber keeps the agent inside its walls, getting the shells into it has the potential to be hugely dangerous for the workers. That's why they're running practice exercises to get the process of getting the shells from their pallets into the chamber exactly right, every time. The AP's images show workers running drills using inert versions of the mustard gas artillery shells stacked on pallets, just like the real thing. Robotic arms and transport machines are clearly being used wherever possible—but there are still some flesh-and-blood humans involved, too. And fascinatingly the entire complext is only temporary; the government has already planned how it will destroy the plant itself—and it's not even complete. After the last of the 780,000-odd shells are obliterated, the structure itself will be demolished—in the end, the goal is to take down the buildings by 2023 and hope this whole chemical warfare thing is behind us all for good. All images by AP Photo/Brennan Linsley unless otherwise noted.